The scope of work for this 20.9km section of the Hwy 63 twinning project involved 122,400m³ excavation, minor grading, 377,400 tonne GBC, 107,250 tonneACP, signing, painting and bridge repairs. 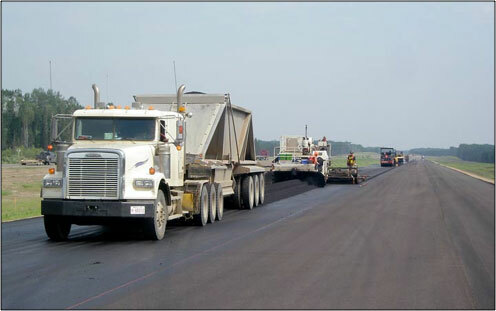 This $32.5 million contract had an accelerated schedule in an effort to complete the twinning of 220 kilometers Hwy 63 by the fall of 2016. The project involved minor grading works, removal of the existing rest stop, horizontal curve re-alignment south of the La Biche River, head slope repairs on the La Biche River, bridge and fish habitat compensation. The challenge was to construct the future southbound re-alignment while maintaining traffic on the existing Hwy 63. This was accomplished by adjusting the original design to meet field conditions. Once the tie-in was finished traffic continued to use the existing highway until work on two adjacent projects was complete. This project was completed on schedule.